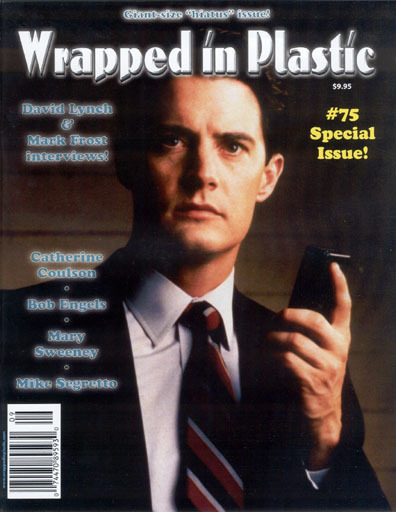 In yesterday's mail, I received the 75th issue of WRAPPED IN PLASTIC, the magazine devoted to TWIN PEAKS and related cult television. Though I am very fond of this magazine and have read some marvelous articles in it, I must admit to occasionally shaking my head over new issues as they continued to filter in... in the best possible way, of course. It has been a wonderment to me that Craig Miller and John Thorne of Win-Mill Productions and their contributors could continue, for so long, to find so much worth exploring, discussing, and debating about the two-season David Lynch series. The show has had more than a decade to cool off, but Miller and Thorne have never allowed their torch to go out. In their latest, deluxe, 64-page issue, the fan phenomenon of WRAPPED IN PLASTIC (WIP) finally hits a wall of sorts, with its editors announcing that WIP #75 is their "last regular issue," marking "the end of a rewarding and memorable chapter in our lives." I can't help wondering: Is this the end of Rico? As a fellow publisher and editor, I know all too well that the reasons not to publish a print magazine far outweigh the reasons to do so. Magazine distribution has changed greatly in the last decade; it used to be a dozen different companies who didn't pay their bills, and now it's basically one huge monolithic company that sends back returns so pristine it's obvious they've never spent an hour on a magazine stand. Then there are the big bookstore chains, who encourage their customers to sit in big comfy chairs and sip lattes all day while they read your product for free. Publishers are also expected to pay for "shrinkage," the brainchild of some brilliant lawyer who couldn't see why his bookstore clients should be financially responsible for copies of magazines stolen from their premises. (Why, then, do these stores have so many security cameras? Are they real?) And there is also the here-take-it phenomenon of the Internet working against the concept of readers paying for the privilege of access to well-written articles, essays, reviews and editorials. Add to all this what hard work it is, and it's really no wonder that some publishers get tired and hang up their hats. I was very pleased to discover that WIP has decided to go out with a bang: WIP #75 is one of the best issues they've ever done. 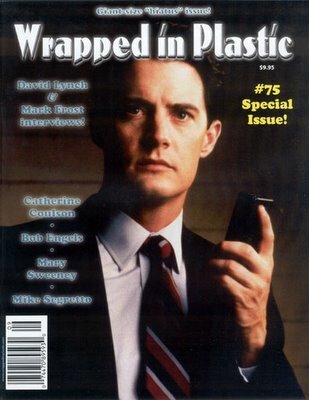 In addition to interviews with David Lynch, co-creator Mark Frost, chief writer Bob Engels, Lynch collaborator Mary Sweeney, and log lady Catherine Coulson, there is a complete WIP index and an assortment of fresh articles, including one consisting of further thoughts on aspects of TWIN PEAKS FIRE WALK WITH ME that Miller and Thorne never managed to accomodate in earlier efforts. The principal topics of these thoughts are: Garmonbozia, the song standards referenced by Federal Bureau of Investigation Special Agent Dale Cooper (Kyle MacLachlan) during his appearance in the movie, and that enticing topic nobody wants to talk about, Judy. Great stuff. On the Win-Mill website, the question of WIP's future is handled less definitely than in the magazine itself. Online, Craig and John are calling #75 a "hiatus edition" -- so the door is being left open for a possible return, but as the old song goes, "who knows where or when?" Like TWIN PEAKS itself, we hope that WRAPPED IN PLASTIC will return in some form, someday -- perhaps when the deleted scenes from FIRE WALK WITH ME finally turn up on DVD. In the meantime... Vale, Craig and John, and heartfelt thanks for a job well done. Given that print magazines seem to be dropping like flies, it's all the more admirable to see a new one preparing for take-off. Jessie Lilley, the former publisher of SCARLET STREET and WORLDLY REMAINS, is now taking wing as the editor-in-chief of a new magazine, MONDO CULT. As the title suggests, the focus is on the world of cult entertainment. The first issue contains departments addressed to new movies on disc, new music (including an especially solid collection of soundtrack reviews), new books, and more. 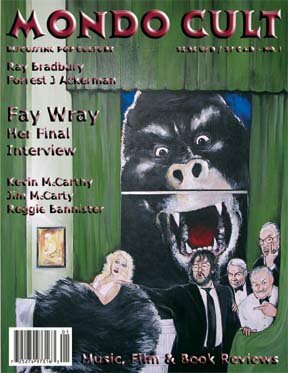 The roster of contributors includes some familiar names, like Ray Bradbury and Forrest J Ackerman, but also excellent work from publisher Brad Linaweaver, Terry Pace (who offers Fay Wray's final interview) , Jerry L. Jewett, Michael Draine, Paul Gaita, and others. #1 has a KING KONG focus that's not exactly unique at this point in time, but I suspect future issues will be more inclined to go their own way. More power to them; I'm interested to see what MONDO CULT becomes. The indicia page says it will be published twice yearly, so let's see what we can do to encourage Jessie and Brad to publish more frequently. Do your part by picking up a copy at your favorite newsstand today. VideoWatchBlog is a participant in the Amazon Services LLC Associates Program, an affiliate advertising program designed to provide a means for sites to earn advertising fees by advertising and linking to Amazon.com. All content (c) by Tim Lucas. All rights reserved. Awesome Inc. theme. Powered by Blogger.